Mice can squeeze through the tiniest of spaces to get where they want to go - even the tiniest of gaps make a perfect entrance. 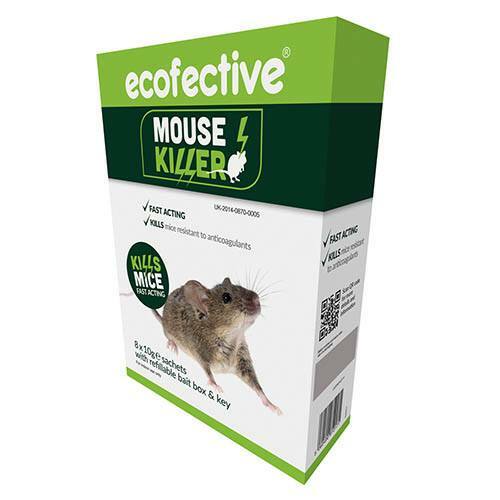 ecofective Mouse Killer is a fast acting non-anticoagulant bait. Highly reliable, the bait works by anaesthetising the rodent instantly. Simply open the refillable bait box with the key provided and place the bait in the compartment. Close the lid and leave in an area near the infestation. Once passed away, if a cat or wild animal digests the mouse the product will have no effect on them. Supplied with a lockable, refillable bait box, the pack includes 8 x 10g sachets with bait box & key. For use on mice only, not effective on rats. Supplied with a lockable, refillable bait box, the pack includes 8 x 10g sachets with bait box & key. Place near mice infestations, for indoor use only. Unlock refillable bait box using key secured on the side of the box. Place bait sachet in compartment and close box lid. Do not open the sachets. Bait should be laid for periods of at most 7- 10 days. Search for and remove dead rodents at frequent intervals during treatment, at least as often as when baits are checked and/or replenished. For further instructions including safety handling and disposal please see product label.